My name is Suad Cokljat and I am 36 years old. I was born and live in Zagreb, Croatia where I own a high quality audio recording studio. I have been in the music business for the last 22 years. Age of 14 - Started playing keyboards in a teenage rock band "Bach". Age of 16 - Recorded my first album with "Bach". Age of 18 - Graduated high school in mathematics/informatics. Age of 18 - Joined band "Riva", the winner of Eurovision song contest in 1989, as a keyboardist. Age of 20 - Built my first analog recording studio and started working full time with music composing and production. 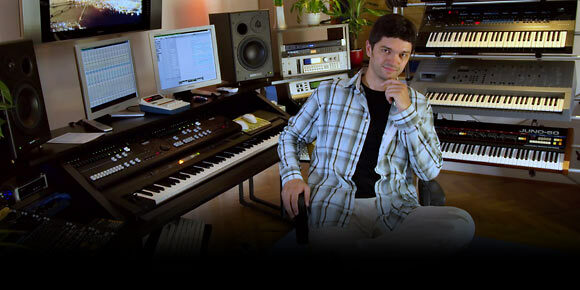 Age of 20–24 - Produced, composed, recorded and mixed many albums for various established artists in Croatia, Slovenia as well as Bosnia and Herzegovina. Age of 25 - Completed the mandatory military service. Age of 26 - Founded Indigo Audio LTD. and built a modern digital recording studio. Age of 27–36 - Produced and composed more than 100 TV commercials and a number of short movies. Proficiency in:Top quality composing always meeting the deadline. Various music styles include : pop, r'n'b and rock, various dance-styles, world music, ambient, film music and full symphonic orchestral arrangements. Expertise in:Recording, mixing, sound effects and mastering. Experience with analog equipment, analog recording, digital recording and hard disk workstations. Other skills include:Cabling, computer hardware (PC), audio software, electro-technics, soldering, repairing, modding and tweaking of various equipment. Short term plans: Getting connected with talented composers, work with new challenges and expand my knowledge as well as acquire more quality credits. A selection of high profile projects is below with particularly important project as well as projects made for international customers highlighted in blue; a full list of projects is available on request. 2002 - 2006 : music, sound effects and mixing of more than 50 TV commercials in various music styles. 2000 - 2006 : music, sound effects and mixing of 7 short animated movies in various music styles. 1995 - 2006 : produced, recorded and mixed more than 20 CD albums in various music styles.